However, as a family, sometimes we just need a break without the need to go anywhere. Our answer has been the city break in our own hometown of Melbourne and spend a bit of time playing tourist in our own city. Even though we live quite close to many of the things we like to do in the city being that bit closer makes it easier and more relaxing especially when we subtract the need to do housework and cook. The city stays we’ve done so far has been great successes – helped in no small part by a great place to stay in the Ovolo Laneways Hotel. And it’s fabulous – we knew the first time we stayed we would have to contact Ovolo Melbourne for another stay. 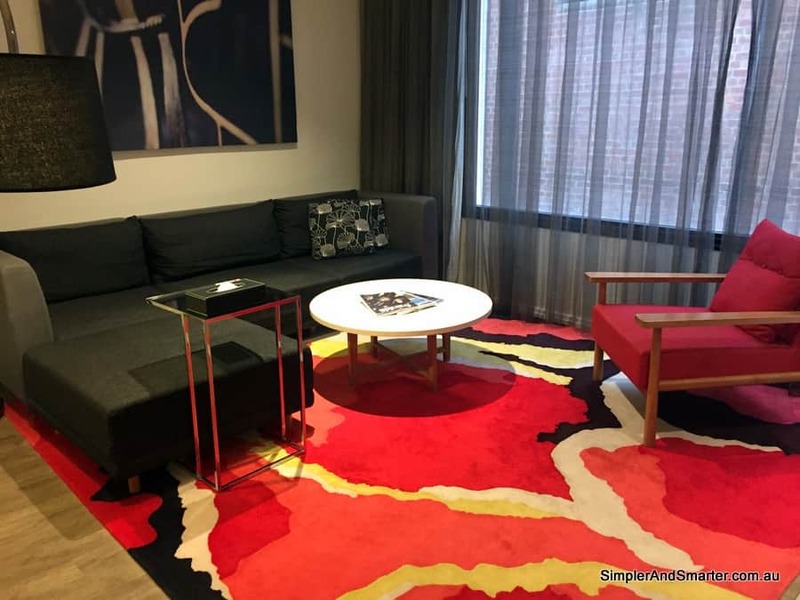 This is our Ovolo Laneways review from our most recent stays in 2018 and 2019. The Ovolo Hotel Melbourne is a small and simple “boutique” hotel. It has great rooms and we’ve found it fits our needs perfectly. Although I suspect it’s designed for business travellers, it works great for families as well. From the free lollies at reception to the spacious rooms with nice kitchenettes, this is a great place to stay. The rooms of the Ovolo are small yet well designed and feel spacious for hotel rooms. They are more like serviced apartments. We’ve stayed in both one and two bedroom rooms here and both have been a good size. Each has had a good sized lounge with a big couch and a nice table to eat at. Both rooms also had a small but functional kitchenette with a decentÂ fridge, a microwave and a sink. There are glasses and mugs, plates and cutlery and tea and coffee making gear but no other cooking equipment. A tea towel and cloth would be nice but there’s plenty of paper towel. 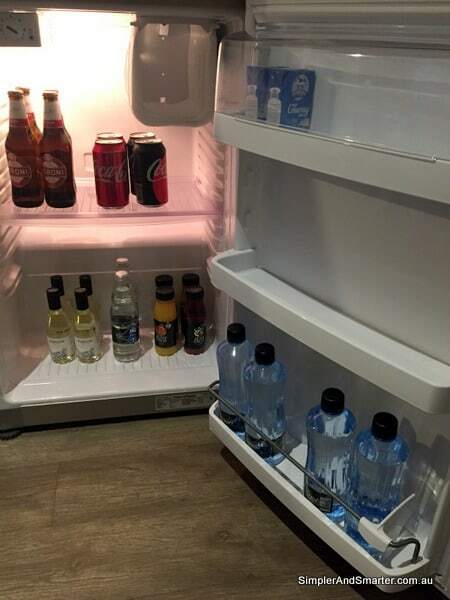 The fridge is also the mini bar which is included and well stocked! On both occasions, there have been beers (Peroni), small bottles of wine, juices, cokes and water. Despite being free they aren’t stingy on either arrival or servicing. On our last stay, they noticed we’d drunk most of everything so gave us extra on top of what was there on arrival! I have to admit this is one of my favourite bits of Ovolo. Our included minibar at the Ovolo. It was awesome. The lounges have both been great places to chill in or have a small party in like we did last time! There’s plenty of floor space and Baby J could roam around happily. Both rooms had big screen TVs with Foxtel, a DVD player and an Apple TV which we could use our Netflix account with. We didn’t want to watch much but we had no shortage of options when we did feel like something. The bathrooms and bedrooms are small to accommodate everything else but still big enough to be useful. We managed to fit a portacot (supplied) in the main bedroom without too much effort. The beds at Ovolo Hotel Melbourne were nice and comfy. The bathroom was well stocked with supplies and lots of towels. That’s one thing that gets to me – most hotels don’t have enough towels, especially for a family but it’s not an issue here. One of the bedrooms in our family suite. Small but big enough. Overall, we could have stayed in the two bedroom family room for more than the three nights we did. It didn’t feel like we were on top of each other (well, maybe a little but that’s normal) and we could all play or relax without getting in each other’s way. Our living, kitchen and part of the dining area. This photo does not do it justice! More recently, we stayed in the terrace suite. This suite is just absolutely perfect, awesome, wonderful and any other hyperbole you wish to add. It’s huge with absolutely fantastic and funky furnishings, many extras and so much light. There’s two bedrooms, two decent bathrooms, the main living area with kitchen and dining and a very awesome terrace. We spent a fair bit of time out here and I loved it. There is also a lot of light which was somewhat lacking on our previous stay. The minibar was crazy stocked – so many drinks! They also give you a full bottle of sparkling wine on arrival. We decided we wanted a different bottle of wine instead later so they tossed in another bottle as well. It’s really crazy good service at the Ovolo. Facilities are where The Ovolo Laneways Hotel shows its boutique side. There are not a lot of facilities here but what is here is well done. One of the best bits is the breakfast. From 7am to 10am on the 5th floor there’s a kitchen/dining/lounge space with access to a rooftop deck with lovely views. The kitchen is stocked with cereals, pastries, fruit, bread and spreads with a fridge full of milk, juices, bircher muesli, fruit salads and yogurts that you help yourself to. Plus there’s a Nespresso machine and a range of teas. It’s not a massive range compared to a breakfast buffet but instead feels like the right amount of options not to be over the top and is much closer to what we’d normally eat for breakfast while still being different enough to feel a bit special. I liked that everything was nice and healthy enough that we could eat a good breakfast that filled us up without being excessive. All the facilities to toast or heat plus bowls, plates and cutlery are all laid out making getting what you want easy. Then you could enjoy eating at the bench or an indoor or outdoor table or just on a couch in front of a big TV. Or take it back to your room which is what we did. It’s actually one of my favourite hotel breakfasts because it’s all so easy and casual. Serving yourself on your own schedule is great for families. Ovolo also hosts a daily Happy Hour with drinks and snacks from 6pm to 7pm. On our first visit, it was held in the same area as the breakfast and was a lovely bonus to our stay. It had a great atmosphere and was reasonably kid-friendly. However, the last time we visited the drinks had been moved to reception which is much smaller and also less fun and the confined space felt too hard to take three kids to. As mentioned in the intro, there are free lollies in the reception which you can help yourself to as much as you want. Our kids loved this! Also in the reception are drink fridges you can take things from whenever you like. On our first stay there was water, juices and beers but on our most recent visit, there was just water. Still, with the mini bar, it’s not too bad and it was nice to grab some water on our way out somewhere or grab one on the way back to the room. It’s a nice touch. Finally, for longer stays, the Ovolo Melbourne Hotel has a free laundry on level 2 with washers and dryers (and free laundry powder). Open from 7am to 9pm, it makes a longer stay or an urgent wash possible. The Ovolo Laneways Melbourne is located at the eastern end (or the “Paris end”) of Little Bourke Street, just down from Spring Street. While it is a quieter area of Melbourne’s CBD, it’s well located for dining and transport and still easy to get anywhere else in the CBD you need to go. Dining-wise, it is really close to Melbourne’s Chinatown, which is located a block down Little Bourke St. It’s no longer the sole location for (east) Asian food in Melbourne’s CBD but it still has most of the best. Unsurprisingly it is mainly Chinese (predominantly Cantonese with some Sichuan) at prices ranging from cheap! to whoa! but has some Japanese, too. Swanston Street is a 10 to 15-minute walk away and has more Japanese plus Korean, Indonesian, Thai and more. There are plenty of options on Bourke Street, too as well as a great Greek option just a few doors down (Kri Kri which has good food in massive portions). The Melbourne CBD has no shortage of places to eat or drink though! If you want to get supplies there’s several convenience stores and mini-marts close by. There’s a big supermarket in the QV centre on Lonsdale Street, about 10 minutes away on foot. Hotel Ovolo Melbourne is well hooked up for transport. Parliament Station is just off the end of Little Bourke Street and is two minutes away. Being close to Bourke and Collins Streets means there are lots of trans nearby and the free City Circle tram is also really close on Spring Street, too. If you’re looking for a hotel with many room options, tons of extras, in a fantastic location that’s also lots of fun, you really can’t beat the Ovolo. We keep going back, even though it’s only a few kilometres from our home, because we love it. And it’s not just for adults… The kids are already asking when we will go again and we only got back yesterday! Sound interesting? You can check out the latest prices here. You can also read about another Melbourne hotel in our Pegasus Apart’Hotel review or find more Melbourne content here.